Brand managers, visual merchandisers and store managers that are responsible for the point-of-purchase display advertising of products at retail have a unique challenge when it comes to displaying products in either hardware store environments or in stores where the retail fixtures are pallet racks or hyper racking systems. Stores that use these types of racks go beyond just hardware or DIY stores. They often include home centers, pet supply stores, office products stores and even some food retailers. The reason that these stores use pallet racking or warehouse racks is usually to convey to their customers that they are extremely high volume retail environments and that their shoppers can enjoy the resulting low prices because of it. 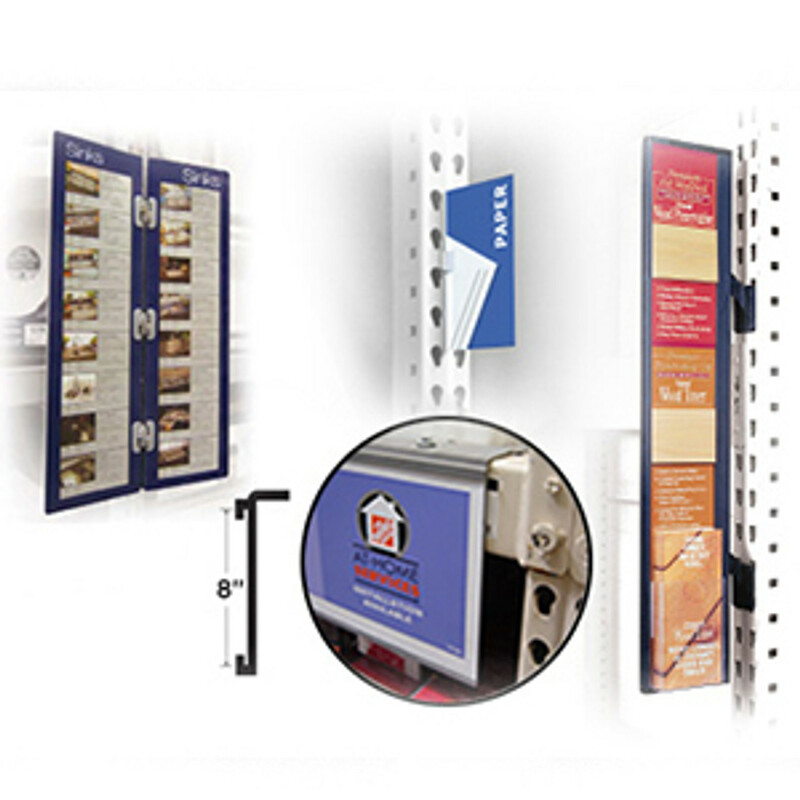 Warehouse rack stores or home centers have special in-store signage requirements that are different from stores where the bulk of the shelving is gondola. Retail signage and sign holders that are designed for gondola shelving in most cases simply do not work in a pallet rack environment or if they can be used they usually are not sturdy enough to survive for any length of time. Signage in a warehouse rack store can generally be split up into two main levels. Overall wayfinding or directional signage gets a shopper to the right area of the store depending on what they are searching for. Once the consumer is in the right area of the store then the second level is more brand and product informational signs. Wayfinding or navigation signs need to be read from a distance, be very clear and easy to read and can employ category differences like coloration or variances in typography to stand out one from the other. These types of directional signs can also be used in conjunction with store decor or decorative elements that reinforce the categories that are unique to the retailer and that they are known for. Types of navigational sign holders include aisle violators, large overhead signs and warehouse aisle signs. Sometimes aisle signs are either attached directly to the pallet racks or they are of the hanging variety. Retail headers are often horizontal and face the consumer once the shopper is in front of the specific display. These signs are more informational and may have how-to or DIY information on them. They can be sign channels, c channels or overstock signs. So in general - aisle signs and aisle violators get you to the desired destination at the store. Then headers and sign channels hold signs that help you decide what to buy. DGS Retail has a large assortment of both hanging aisle signs for warehouses and aisle signs that attach directly to the pallet racking. Models for both options are offered that have interchangeable category signs or product inserts. This allows for re-laying out or shuffling the products shown down each aisle without having to change the whole sign. Just add more printed inserts. Most aisle signs are custom printed and ordered online. They are made from virtually indestructible thick PVC material for long life. When retail sign holders are used in a pallet rack store they are generally used to advertise brands and how-to information to consumers. They also can be used to show shoppers the comparable features and benefits of different brands in the same product category. An example of this in a hardware store situation would be for a lawnmower display. At a major home center the lawnmower models may be displayed on a warehouse rack shelf or beam. The first level of signage required to effectively display this would be the signage that gets the shopper to arrive in front of the lawnmowers. A combination of hanging aisle signs that advertise the lawn & garden department and then aisle signs down the aisle to show the shopper where the lawnmowers are located should get the consumer to where they need to be. Signage would then be required either at the brand level or to advertise all the brands shown in the bay and then to show the features and benefits of each of the brands. This would be done with headers, toppers or sign channels displaying signs with the brand and comparable features information. These pallet rack signs have to be engineered with unique qualities in order to work effectively in a warehouse rack store. DGS Retail has specially tested aisle violator sign holders that have been cycle tested 25,000 times to prove that they can withstand the brutal environment and forklift traffic that they are subjected to on a daily basis in some of these stores. Many of these warehouse sign holders have other special properties that allow them to be fully versatile on pallet racking. Special sign brackets and sign hinges that can be placed over horizontal rack shelves or beams help when sign height consistency above the floor is important as an example. Retail Headers that provide ample advertising and brand space but still allow access to the overstock storage space that’s behind them are offered for sale. These types of signs tend to be horizontal in nature and move out of the way to get at the overstock stored behind them. Many different kinds of headers are sold. Flip signs move out of the way by flipping upwards or downwards. Barndoors are offered that pivot similar to regular doors for overstock access. Sliding signs move up and down vertically like a garage door for back stock access. C channels of all sizes and attachment methods are sold. Some have living hinges so that they can be lifted out of the way. Many are simple sign channels and mount direct to the warehouse rack shelf or beam face to hold promotional signage. Choose from a large collection of small sign holders for warehouse racks. These include magnetic sign holders that can be positioned directly to the rack uprights or to the beam faces. They can hold small sale signs or bay location signs. Additonally. there are plastic warehouse aisle sign holders that clip into the teardrop holes or slots on the uprights and many different shelf edge sign holders and grippers. Choose from DGS Retail’s selection of plastic C channels and J channel sign holders. These are used to hold brand advertising signs or product feature information direct to the pallet rack cross beams. They are also used on warehouse rack shelves. They can be attached to the racks with screws, foam tape or magnetically. The C channels are offered in a multitude of sizes that will work perfect for your application. Some models have built in hinges so that the C channel can be pivoted out of the way to get at the overstock that can be stored behind it. C channels can be used to create retail headers that descend down from a high beam and angle for easy reading from the floor. There are flat C channel models in different heights that attach to the face of lower beams or belly beams for holding signs at a lower level. Add changeable retail special order book holders direct to the pallet racking uprights or to the warehouse rack shelves. These are some of the best solutions to display special order pages out there. These types of sign books are great to display all the other models of products that are not available in the store but have to be special ordered. Retailers have discovered that offering special order products increases the options that are available to consumers without having to actually stock the merchandise. DGS retail has developed a line of these multi-page sign holders to work within this environment. They mount directly to the teardrop holes on the upright or to the face of the horizontal beams or rack shelves. Custom Warehouse Aisle Signs 11-1/4 x 11-1/4 - L-Shaped Sign - Your Design Included Free! Plastic C Channel Sign Holder - Spring Hinge for Access - Works on Wire Shelves - For Sale in 3 Sizes!